The 4000-series CMOS logic circuits include several itegrated circuits (ICs) that provide several electronic logic gates in a single package. 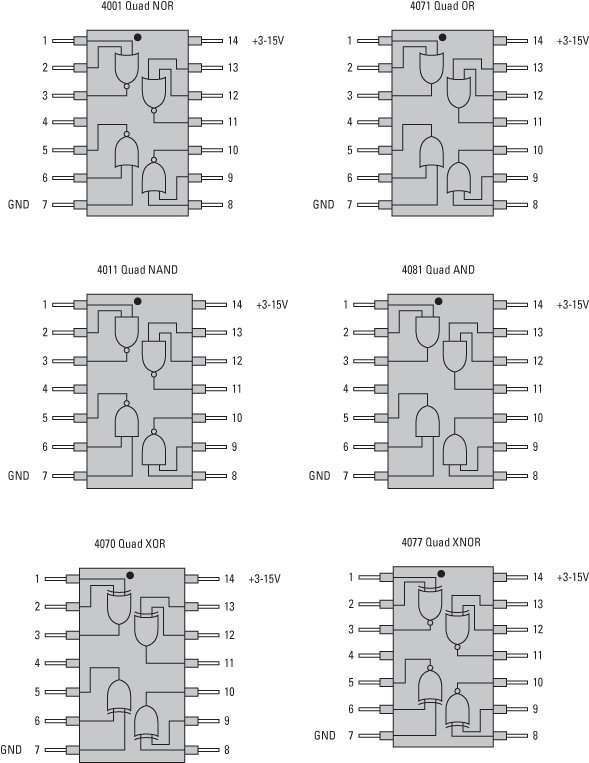 Each of these 6 chips in the series contains 4 2-input logic gates in a 14-pin DIP package. Power, which can range from +3 V to +15 V, is connected to pin 14, and ground is connected to pin 7. Pinout chart for 4000-series Quad Two-Input Logic Gate chips. Note that the 4001 and 4011 chips contain four NOR and NAND gates. Because NOR and NAND are universal gates, you can use them in combination to create other types of gates. As a result, if you stock up on 4001 or 4011 chips, you’ll be able to create any type of logic circuit you may need. The outputs can source as much as 10 mA with a 9 V power supply. At 6 V, the maximum is about 5 mA, which is just enough to light up an LED. If your output circuit requires more current, you can always use a transistor. Just connect the transistor’s collector to the positive voltage source and the base to the logic gate output. Then connect your output circuit to the transistor’s emitter. The output circuit should eventually lead to ground, of course, to complete the circuit. In addition to connecting unused inputs to positive voltage or ground, it’s a good idea to place a small capacitor (47 F is typical) across the power leads (pins 7 and 14). The capacitor helps ensure that the input voltage stays constant. Don’t forget that CMOS chips are very susceptible to damage from small amounts of static electricity. Be sure to ground yourself by touching a metal object before you touch CMOS chips.